EPHESIANS 2:10 KJV "For we are his workmanship, created in Christ Jesus unto good works, which God hath before ordained that..."
7That in the ages to come he might shew the exceeding riches of his grace in his kindness toward us through Christ Jesus. 8For by grace are ye saved through faith; and that not of yourselves: it is the gift of God: 9Not of works, lest any man should boast. 10For we are his workmanship, created in Christ Jesus unto good works, which God hath before ordained that we should walk in them. 11Wherefore remember, that ye being in time past Gentiles in the flesh, who are called Uncircumcision by that which is called the Circumcision in the flesh made by hands; 12That at that time ye were without Christ, being aliens from the commonwealth of Israel, and strangers from the covenants of promise, having no hope, and without God in the world: 13But now in Christ Jesus ye who sometimes were far off are made nigh by the blood of Christ. For wee are his workemanship, created in Christ Iesus vnto good workes, which God hath before ordeined, that we should walke in them. For we are his workmanship, created in Christ Jesus to good works, which God hath before ordained that we should walk in them. For we are God's own handiwork, created in Christ Jesus for good works which He has pre-destined us to practise. For we ben the makyng of hym, maad of nouyt in Crist Jhesu, in good werkis, whiche God hath ordeyned, that we go in tho werkis. 2:10 For we are his workmanship - Which proves both that salvation is by faith, and that faith is the gift of God. Created unto good works - That afterwards we might give ourselves to them. Which God had before preprepared - The occasions of them: so we must still ascribe the whole to God. That we might walk in them - Though not be justified by them. 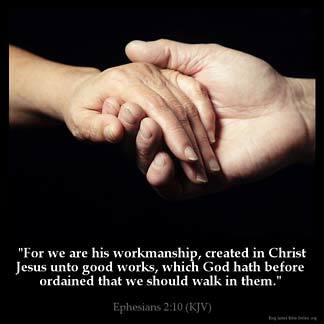 Eph 2:10 For we are his workmanship. It is God who saved us; as new creatures, he had made us through the gospel. We are not saved by works, but are his workmanship, created in Christ Jesus unto good works, designed henceforth to abound in them. Which God hath before ordained that we should walk in them. It is his ordination that all who believe the gospel and are saved should practice good works. God has graciously quickened us, saved us, made us new creatures, and prepared us unto good works. Annette asked "Are we His masterpiece". YES in Christ Jesus we are. What blows me away is the fact that Almighty God did not consider His Son too good for us !!!!! That, we are a PRODUCT of the SPIRITUAL world which GOD owns. We are a property having been created with his own HANDS. First as a mass,then with HIS soul to b living beings. With a purpose to live unto his WILL through His SPIRIT which is not part of the BODY but an intergral unit to confirm with CHRIST through which we connect to/with GOD. We need the spirit as the third element to conquer the BODY n convert it to its IMMORTAL status if we are to defeat the inherited sinful condition. This is the WILL of GOD. are we God's masterpiece? that's what i get with this verse.